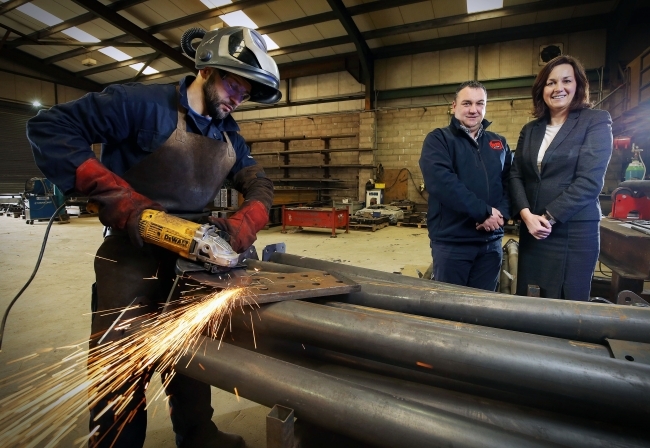 Newry based steel fabrication company, BM Steel has won its first business in Holland and Great Britain, estimated to be worth £800,000 in its first year. The contract is a joint venture with GB structural engineering firm, JB Towers, to supply the company’s products to DAEL Telecomm to service Holland and GB’s telecom market. Mike Mathers, Director of BM Steel said: “In the last six months we have doubled our workforce and almost trebled our turnover. This is due to our ambitious growth strategy and our focus on exporting to help our business grow. BM Steel was established in 2004 and has grown to become a leading provider of Component Parts and Bespoke Structures. The company is a major supplier to Cargotec Ireland and offers works in structural steel and corresponding architectural works and has recently completed projects in London and Scotland. Mike added, “The support and training we have received from Invest NI has helped to increase our confidence in many areas from promoting and selling our products, to how to approach a meeting with a potential buyer”. The company has availed of a range of Invest NI trade support to help secure this new contract, most recently visiting the GB market where it met with a number of potential buyers. Alison Gowdy, Invest NI’s Director of Trade added: “Securing this major contract with one of Holland’s biggest players in the telecommunications industry, DAEL Telecomm, is not only a great result but will also open up more opportunities for the company. This experience has helped it develop the skills and confidence to make professional sales presentations and win new business.